The rundown: This list was winnowed down from seventy-six submissions to nine finalists, five of which will ultimately be nominated. I’ve seen a few of the films that didn’t make the cut after being initially submitted by their countries, the best of which was “The Past” (Iran). It’s a shame that it’s not here. The other ones I have seen are “In Bloom” (Germany), “The Good Road” (India), and “Gloria” (Chile), none of which I’d feel strongly about needing to make the list. “Blue is the Warmest Color” was not submitted by France, and Golden Globe nominee “The Wind Rises” is eligible for Best Animated Feature rather than here. 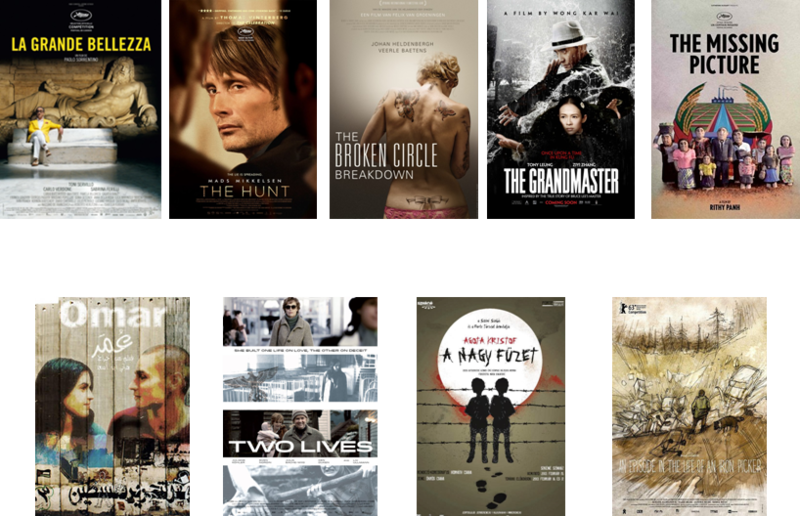 Of the nine, the two frontrunners are both the Golden Globe nominees and the only two films I’ve seen, The Great Beauty (Italy) and The Hunt (Denmark). The latter is available on DVD already, and two other films have already had theatrical runs and will be out on DVD in March shortly after the Oscars: The Broken Circle Breakdown (Belgium) and The Grandmaster (Hong Kong). 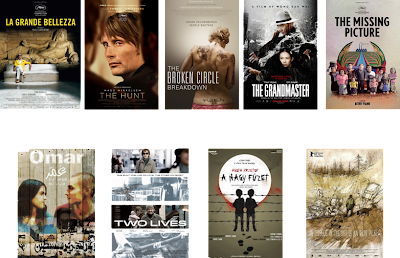 Also contending are An Episode in the Life of an Iron Picker (Bosnia and Herzegovina), The Missing Picture (Cambodia), Two Lives (Germany), The Notebook (Hungary), Omar (Palestine). It looks like I’ll have the chance to see Palestine’s submission later this month, and I hope to see the others as well. In this category, the director of Palestine’s entry was previously nominated in 2005 for “Paradise Now,” and the director of Bosnia and Herzegovina’s film won in 2001 for “No Man’s Land,” which beat “Amélie.” For country stats, Italy has won most – thirteen times – out of a total of twenty-seven nominations. Denmark has won three times, and has been nominated nine times. Germany has also been nominated nine times, with two wins. Belgium has six nominations (no wins), Bosnia and Herzegovina is one for one, Hong Kong has two nominations (no wins), Hungary has eight nominations (one win), and Palestine was previously nominated as the Palestinian Territories in 2005. Without a Best Picture nominee in the race this year, this category might be more interesting, and I look forward to seeing more of the slate. One possible crazy scenario: Without having seen most of the contenders, I’d say that a snub for Golden Globe winner The Great Beauty would be almost as surprising as “Volver” and “The Intouchables” being snubbed in the past.